For this evaluation I will be looking at a state contributing primary school based in one of the major cities of New Zealand. 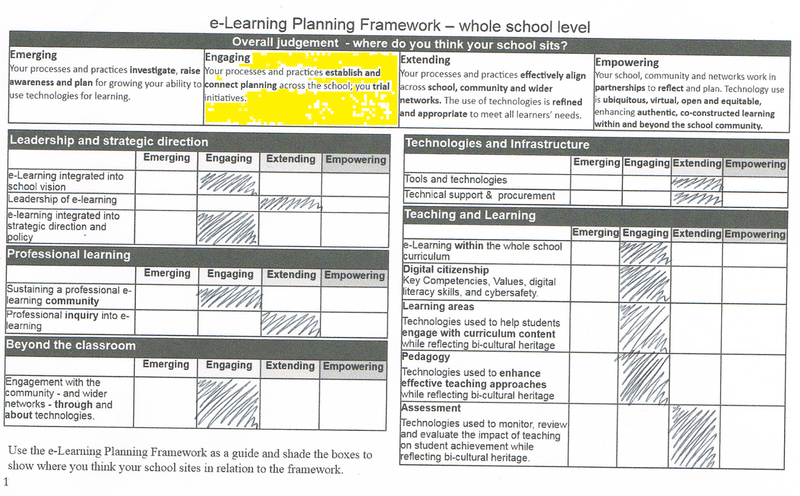 My overall judgement is that the school is currently sitting at the "engaging" stage of the eLPF framework. I have placed this school in the engage stage. The school vision talks about how ICT is used to support the school curriculum. Senior management and staff within the school mentor others on the use of technologies to enhance the teaching and learning. cybersafety is briefly touched on and the needs of the children sometimes informs the strategic plan. Teachers within the school are very good at trialing and reflecting on ICT in action, they are heading towards the impact of e-Learning on identified learning needs. There is a supportive culture throughout the whole school in relation to e-Learning. The e-Learning throughout the school is getting better as teachers are continuing their professional development by attending additional courses for implementing ICT more effectively within the classroom, there is support to allow the teachers to ask questions and personalise the use of ICT for learning purposes. Technologies are being used to engage with the community however this is minimal. There is a school facebook page and class blogs that are used to engage with the community but these are often not updated and irregularly checked for comments. The school has a lot of access to reliable ICT resources, each class a a mixture of resources and classrooms are able to use the equipment from other rooms if required. There is an extremely well managed system in place to improve organisational efficiency. The school network environment is currently being developed so that the it suits the needs of the school and the community. The use of ICT is used across most curriculum areas within the classroom. E-Learning resources are appropriate for the required needs of the learning. There is a growing awareness about digital citizenship amongst students. Technologies are being trialed for their uses in relation to diverse students and if effective are being utilised to help with the learning. The school uses technologies as tools of reflection. Students are freely able to use the technology to share and reflect on their learning. 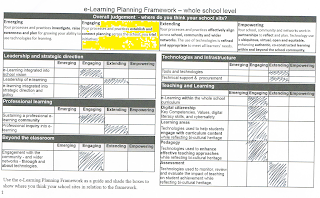 This evaluation was conducted as a personal learning exercise to gain understanding of the eLPF and my evaluation of the school was restricted to public documentation and personal knowledge without detailed insights into all organisational processes.